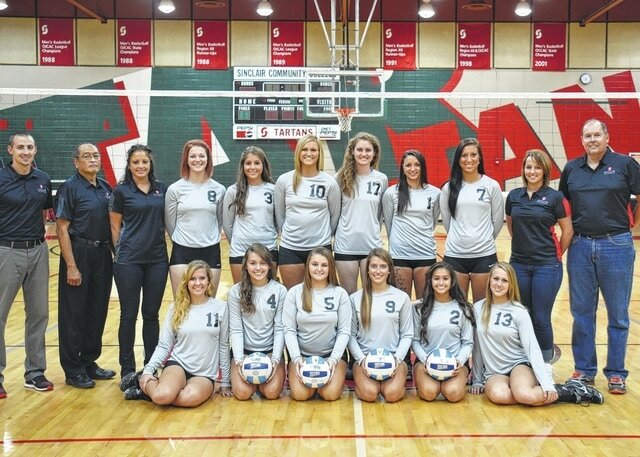 DAYTON — The National Junior College Athletic Association announced that the Sinclair Community College volleyball team earned NJCAA All-Academic team honors for their team from 2014-15. This marks the fourth consecutive year for the program receiving the honor. Sinclair volleyball holds two familiar faces to local Preble County sports fans, as Tiffany Jordan, a graduate of National Trail and Kendra Vanover, a graduate of Tri-County North, were both on the team. Jordan, as an individual, also earned NJCAA All-Academic honors for Superior Academic Achievement. The distinction is for athletes that have earned a GPA between 3.8 – 3.99. Jordan was seventh in her conference for total attacks and ranked 10th in the Ohio Community College Athletic Conference for total sets and kills. Vanover was second on the team in in assists, recording 55 on the year. She also had a 2.15 digs per set average. Other familiar faces joining Jordan and Vanover were Melissa Mireless and Rebecca Moyer, both graduates from Valley View; Krystal Falknor, a Tri-Village graduate; and Erica Cole, a graduate from Dixie. In order to receive All-Academic team honors, teams are required to compile at least a 3.0 GPA to be considered. Sinclair was one of 591 teams from across the NJCAA to earn a team 3.0 GPA or better. The volleyball team joins the Owens Volleyball and Softball teams as the only three OCCAC teams to earn the award.